NOTE: The link above will take you to an interactive site that will deliver your order to the Shelby Jones Company. 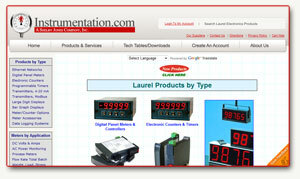 The details of your order/inquiry are separate from the orders you make on Instrumentation.com. If you choose to click the link, it will appear that you are still on our site, but technically, you will not be. Therefore, please check out any shopping baskets you may have created on Instrumentation.com, since they will be lost once you click on the link. If it's more convenient, you can simply fill out our contact form located here and we will get back to you promptly with a part number and pricing for an instrument that meets the criteria that you describe in the form. Remember, you can always call us at 800-346-4620 and speak with a live customer service representative between the hours of 7:00 AM and 5:00 PM Eastern Time. Thanks for visiting INSTRUMENTATION.COM and giving us the opportunity to serve your needs! 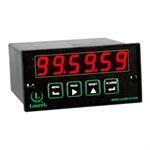 Meter with 9 factory calibrated DC current and voltage ranges for 99.99% full-scale accuracy. 4-1/2 digit resolution to ±19,999 for readout in mV, V, mA or A. 1 Gohm input impedance on 200 mV and 2V scales. Scalable to ±99,999 for use with current shunts. 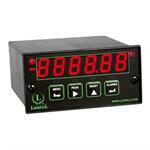 Nine factory calibrated Dcurrent and voltage ranges for 99.99% full-scale accuracy. 4-1/2 digit resolution to ±19,999 for readout in mV, V, mA or A. 1 Gohm input impedance on 200 mV and 2V scales. Scalable to ±99,999 for use with current shunts. This "self-powered" LCD process meter is powered directly by the current loop, developing a maximum voltage drop of 2.5 V.
Exceptional accuracy and high read rate with five digital voltmeter ranges from 200.00 mV to ±300.0 V and four digital ammeter ranges from ±2.0000 mA to ±5.000 A, all factory pre-calibrated. Shipped ready to run. Sensitivity to 20 mV full scale with 1 µV resolution for load cells, strain gauges & microvolt signals. Five-digit display. Accuracy is 0.01% of full scale ± 2 counts at read rates up to 60/sec. Built-in excitation powers four 350-ohm bridges in parallel. Universal thermocouple meter factory calibrated for seven thermocouple types J, K, T, E, N, R, S each in a single range with exceptional accuracy. 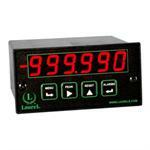 The TC type, display in °C or °F and 1° or 0.1° resolution are user selectable. The Laurel RTD temperature meter displays all ranges of Pt100 platinum, Cu10 copper and Ni120 nickel temperature probes. High accuracy with 2, 3 or 4 wires connection to compensates for lead resistance. 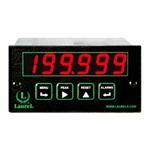 The Laurel batch controller is a low cost and highly accurate batching controller for repetitive fill operations. Available for pulse inputs or analog signals from flow meter transducers. Control is provided by up to 4 relays. Process meter can be scaled to display rate or totalized rate to six digits for 0-1 mA, 4-20 mA or 0-10V analog process signals. 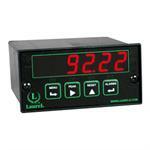 Ideal to display flow rate or volume from the analog output of a flow meter. Choice of relay, analog output and serial output. 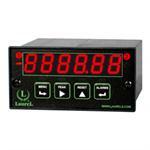 Electronic counter applies arithmetic functions A+B, A-B, AxB, A/B or A/B-1 to inputs A & B for rate or total at frequencies from 0.005 Hz to 1 MHz. For example, totalize or subtract two flows, or take the ratio of two flows for mixing. Enginering units. Two counter channels A & B may be independently set up and scaled to count up from zero (or other value) to a preset limit, or to count down from a preset value to zero (or other limit). Rate and total simultaneously. Up/down counting. Laurel quadrature meter accepts A & B quadrature signals from a linear encoder, shaft encoder, optical encoder or incremental optical encoder to display position, length, angle or rate to 6 places in scaled engineering units. Two independently field-scalable channels A & B are programmable for rate and total, arithmetic functions A+B, A-B, AxB, A/B, A/B-1, and timing. Six-digit resolution at update rates up to 25/s. 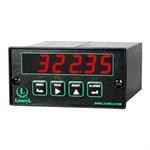 Ideal for display of flow rate and total, RPM and speed. Stopwatch timer times single events from 1 µs to 999,999 hrs. Timing resolution to 0.2 µs. Selectable display of single event time or accumulated time of all events. Selectable H, M or S decimal format or HH.MM.SS clock format. Wide choice of inputs. Time interval meter times periodic events with width of 1 µs to 199.999 s, display resolution to 0.2 µs, rep rates to 250 kHz. Inputs from NPN or PNP proximity switches, contact closures, digital logic, magnetic pickups down to 12 mV, or AC inputs. Laurel digital process and strain meters are a cost-effective solution for monitoring and control applications which require zero and span adjustment for process signals such as 4-20 mA, 0-5 V, 0-10 V, or strain gauges. True RMS AC digital panel meter offers 0.1% accuracy from 0% to 100% of span, 10 Hz to 10 kHz, 3.0 crest factor, and fast response with readings in 0-16.7 ms after each AC line cycle. AC or DC coupling. 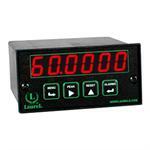 Use as a voltmeter from 200 mV to 600V full scale.